We will be making Blocks 6, 29, 46, 72, 16, 84, 68, 76. Templates used for Month 7 are; 1, 3, 5, 8, 12, 13, 14, 19, 20, 21, 71. We will be using a mixture of fabrics this time. I recommend that you spray the wrong sides with starch and iron well before cutting. Use templates 5, 8, 12. 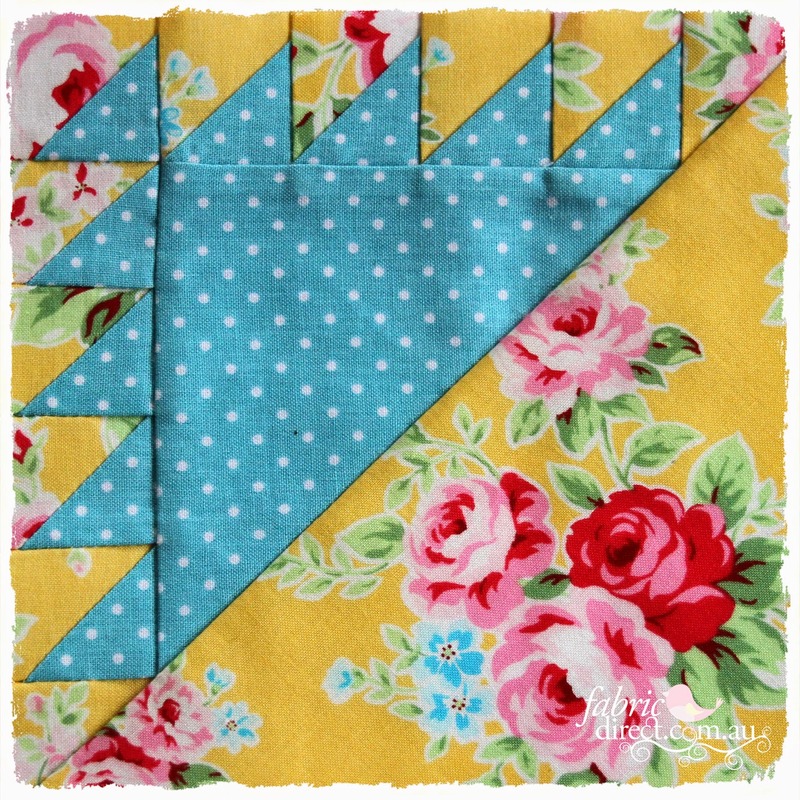 Using the Yellow floral fabric cut 4 x 3’’ squares. 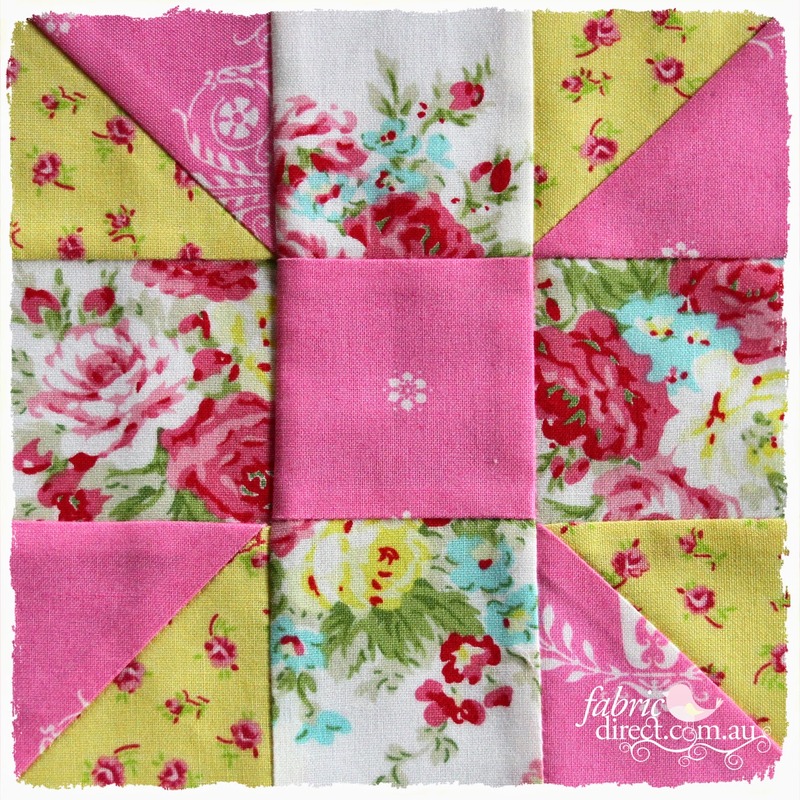 Using the Pink fabric cut 4 x 3’’ squares. 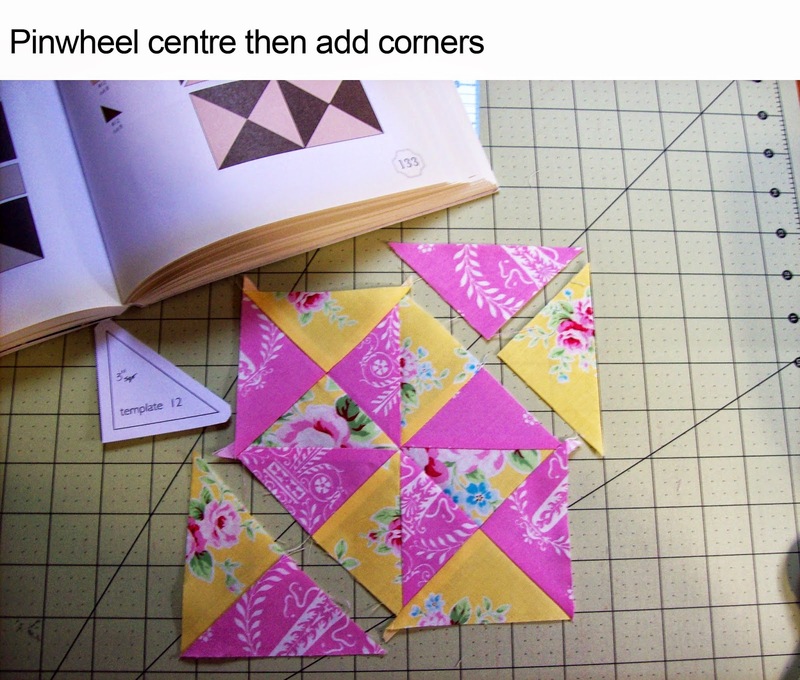 Using 2 pink and 2 Yellow squares make up 4 ½ square triangles, as per week 3, for 8 #12, and sew into a pinwheel for the centre. 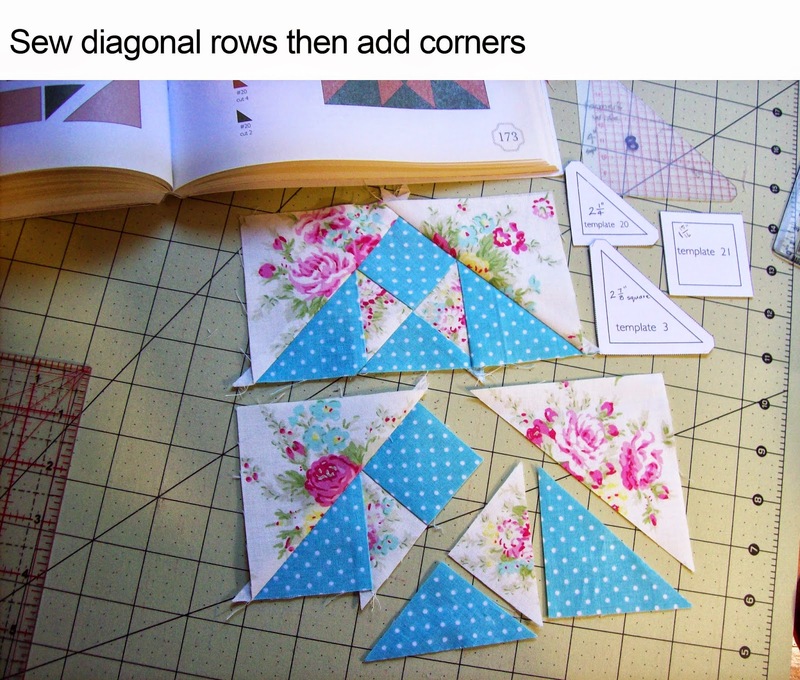 Cut the remaining 4 squares on the diagonal, sew together to make the corner triangles. Sew these to the centre square. Press these seams to the outside. Economy, use templates 5, 8, 12. 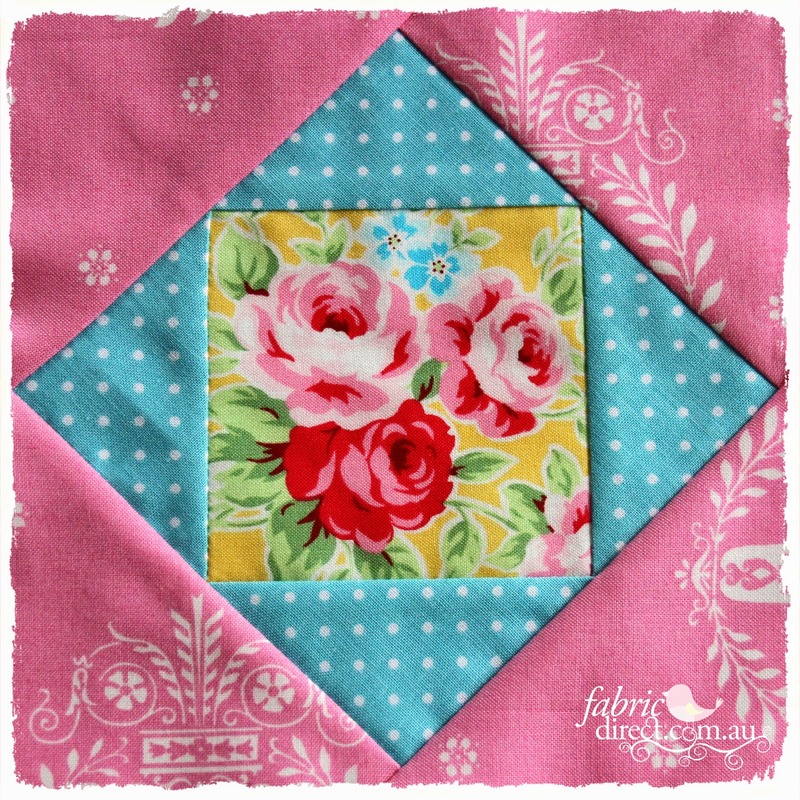 Using the Yellow floral Fussy cut a 3 ½’’ square, with Roses in the centre for 1 # 5. 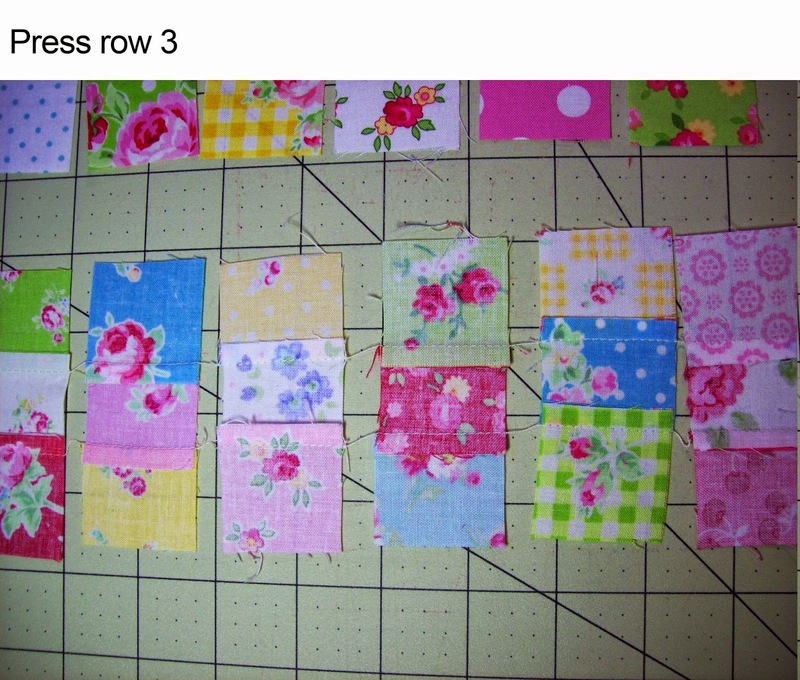 Using the Aqua Spot cut 2 x 3’’ squares then cut these on the diagonal for 4 # 12. 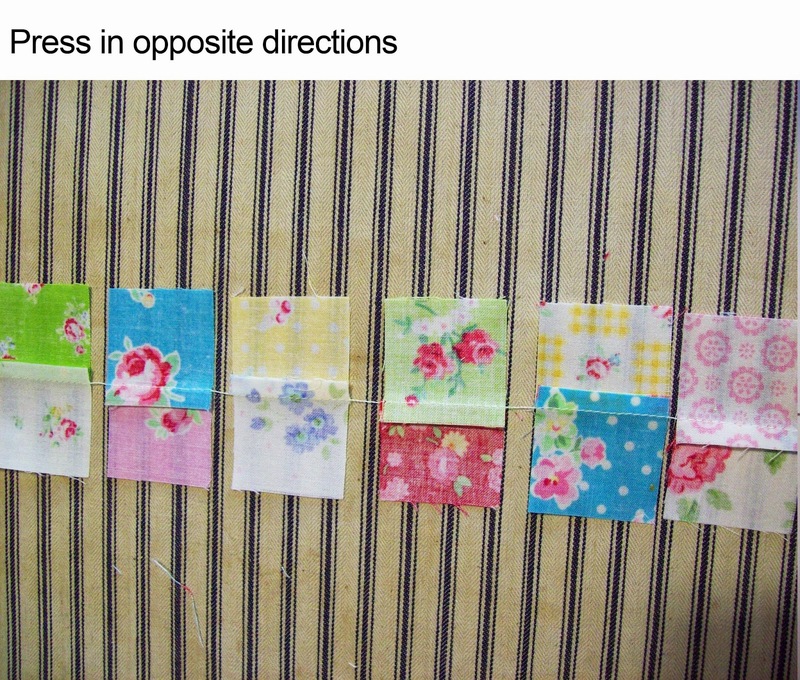 Using the Pink fabric cut 2 x 4’’ squares, cut these on the diagonal for 4 # 8. Arrange and sew these together as per book. Use templates 3, 8, 19, 20, 21. Hill and Valley, use templates 3, 8, 20, 21. 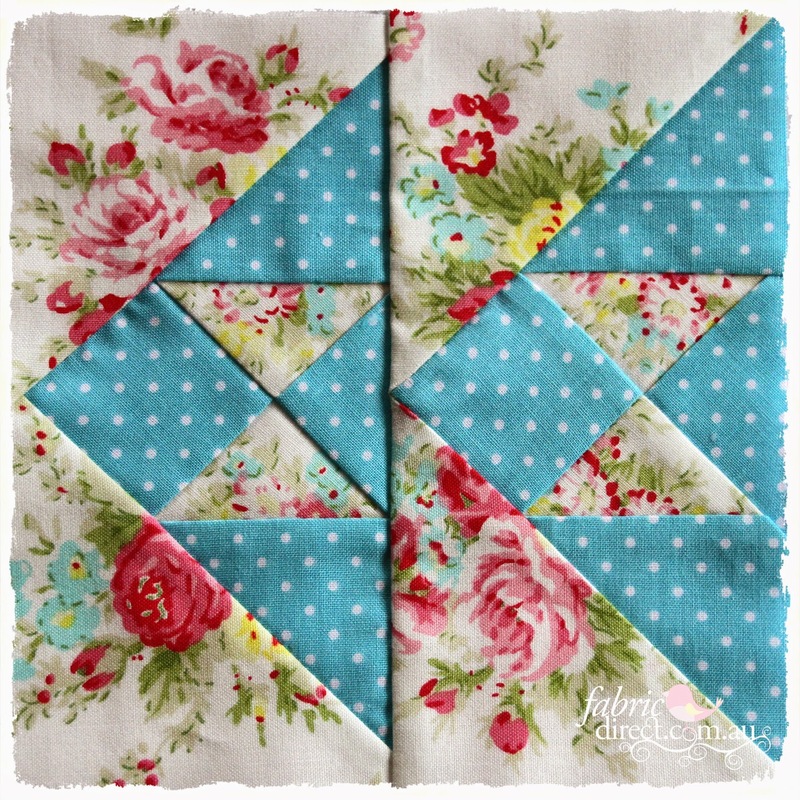 Using the White Floral fabric cut 2 x 4’’ squares, cut these on the diagonal for 4 # 8. 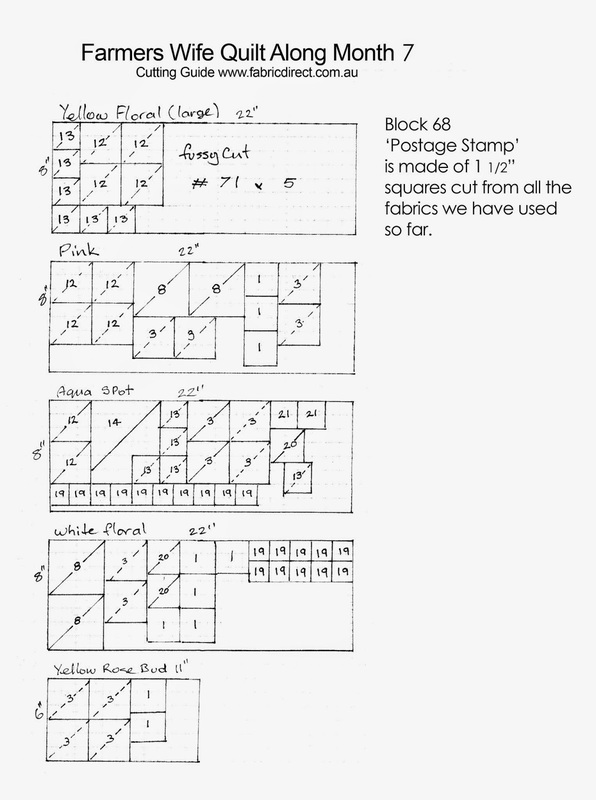 Cut 2 x 2 ¼’’ squares, cut these on the diagonal for 4 # 20. Using the Aqua Spot fabric cut 2 x 1 15/16’’ squares for 2 # 21, then cut 2 x 2 7/8’’ squares, cut these on the diagonal for 4 # 3 then cut 1 x 2 ¼’’ square, cut on the diagonal for 2 # 20. Arrange and sew together as per book. Railroad, use templates 3, 19. 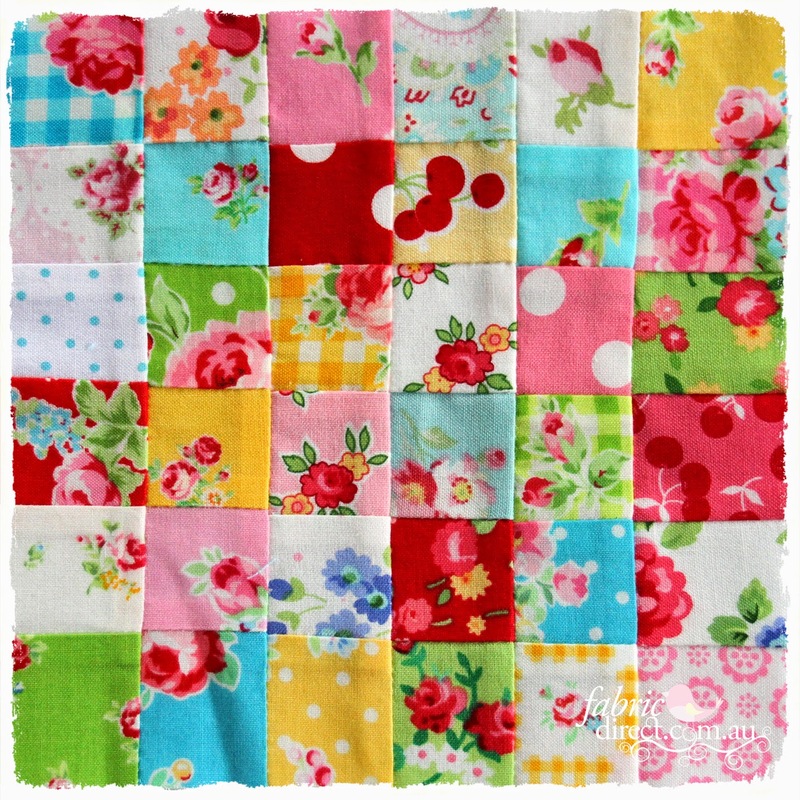 Using the White Floral fabric cut 2 x 2 7/8’’ squares then, cut 10 x 1 ½’’ squares for 10 # 19. 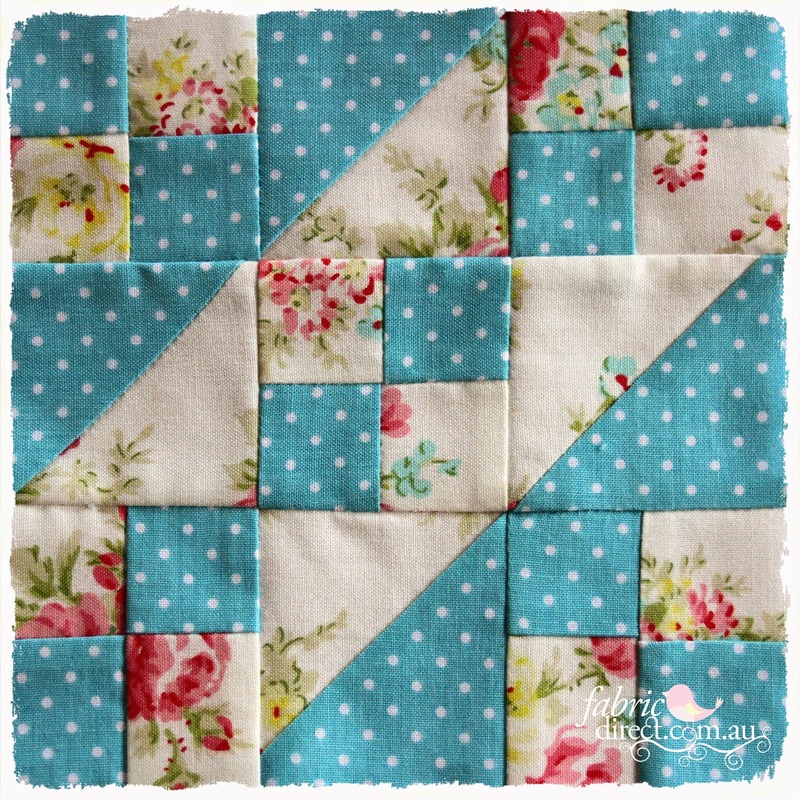 Using the Aqua Spot cut 2 x 2 7/8’’ squares and 10 1 ½’’ squares for 10 # 19, the same as the white. Using the 4 larger squares make up into ½ square triangles for 8 #3. Sew 1 white and 1 aqua square together, press towards the aqua, to make 10 pairs sew again to make groups of 4. Arrange and sew as per book. Use templates 1, 3. 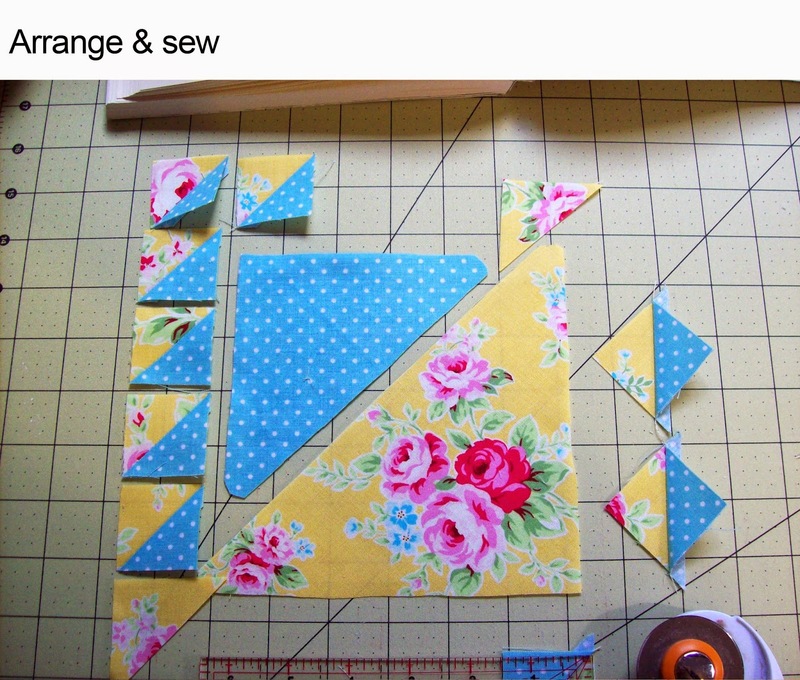 Cut the fabrics for both these blocks at the same time. 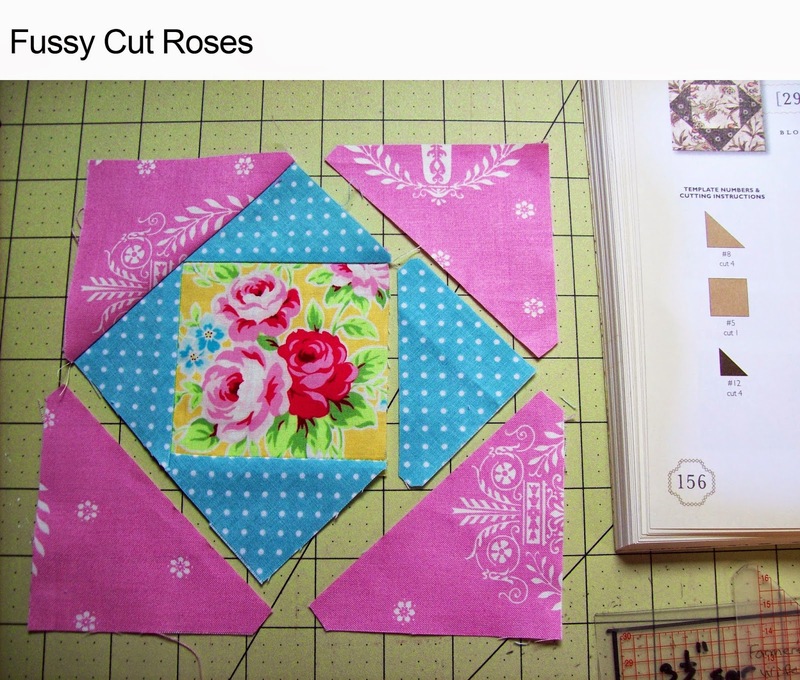 Using the Yellow small Rose Bud fabric cut 4 x 2 7/8’’ squares and 2 x 2 ½’’ squares for 2 # 1. 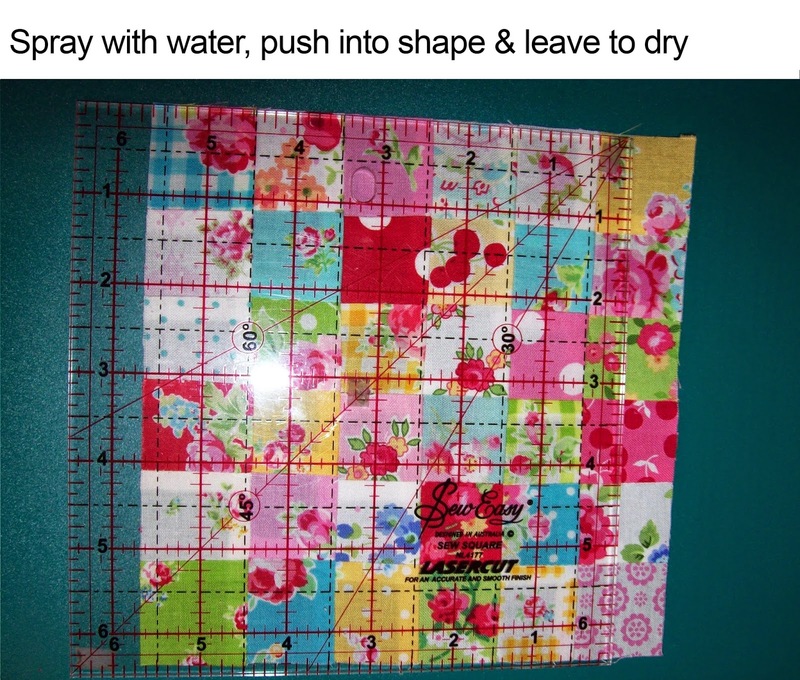 Using the Pink fabric cut 4 x 2 7/8’’ squares and 3 x 2 ½’’ squares for 3 #1. 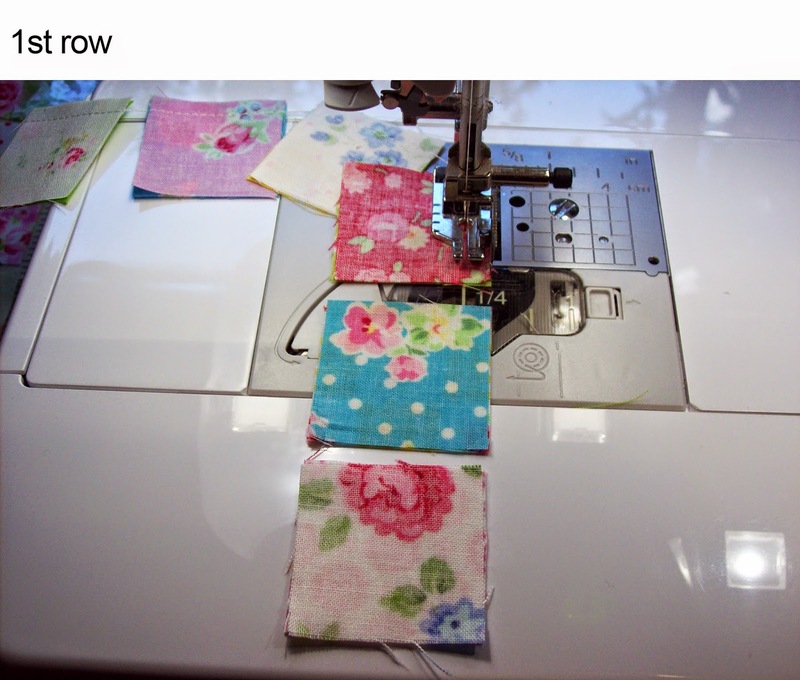 Using the White Floral fabric cut 5 x 2 ½’’ squares for 5 # 1. 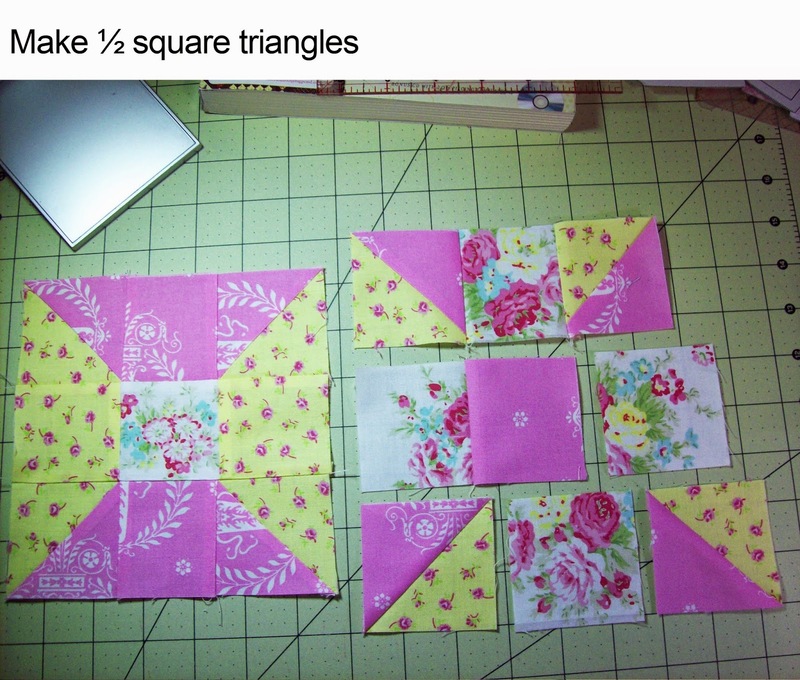 Using the 8 x 2 7/8’’ squares make up into ½ square triangles for 16 #3. 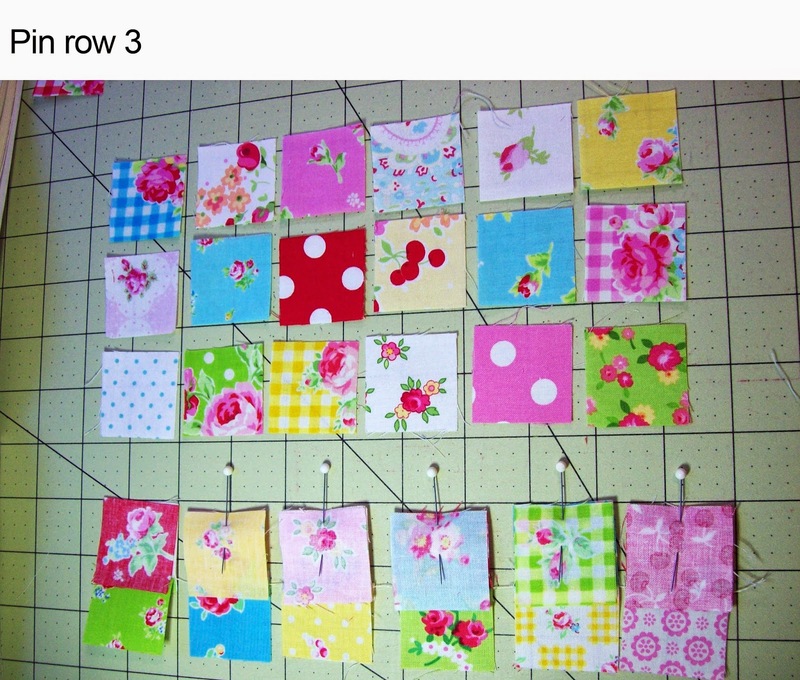 Arrange in place for the two blocks and sew together as per book. Use templates 13, 14, 19, 71. Sawtooth use templates 13, 14, 71. 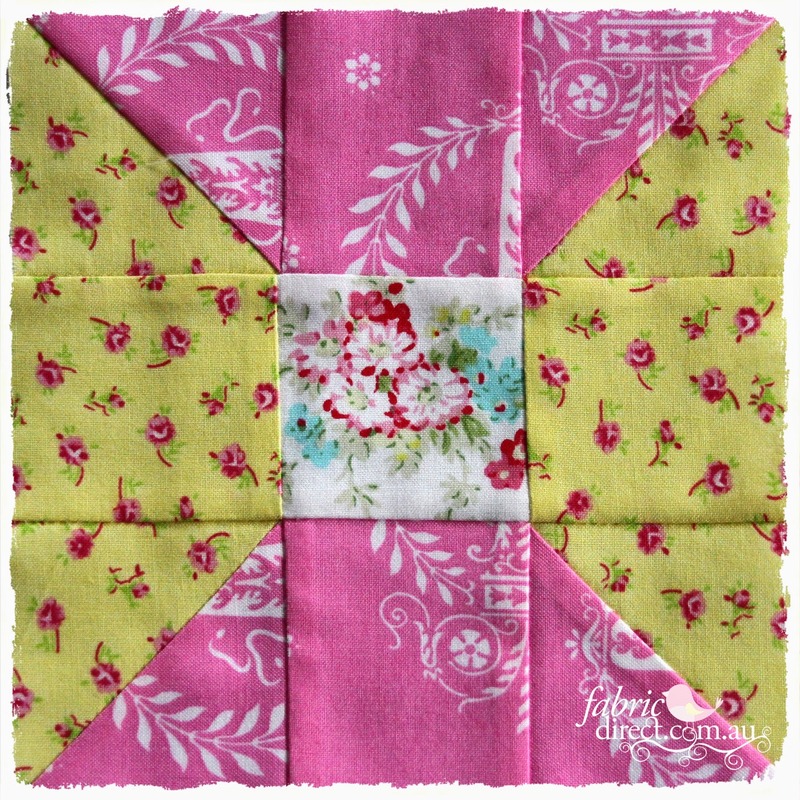 Using the Yellow Floral fabric trace and Fussy cut, with the roses in the centre, 1 # 71. Then cut 6 x 1 15/16’’ squares, cut 1 on the diagonal for 2 #13. Using the Aqua Spot trace and cut 1 # 14, keeping the long edge aligned with a row of dots. Then cut 5 x 1 15/16’’ squares. 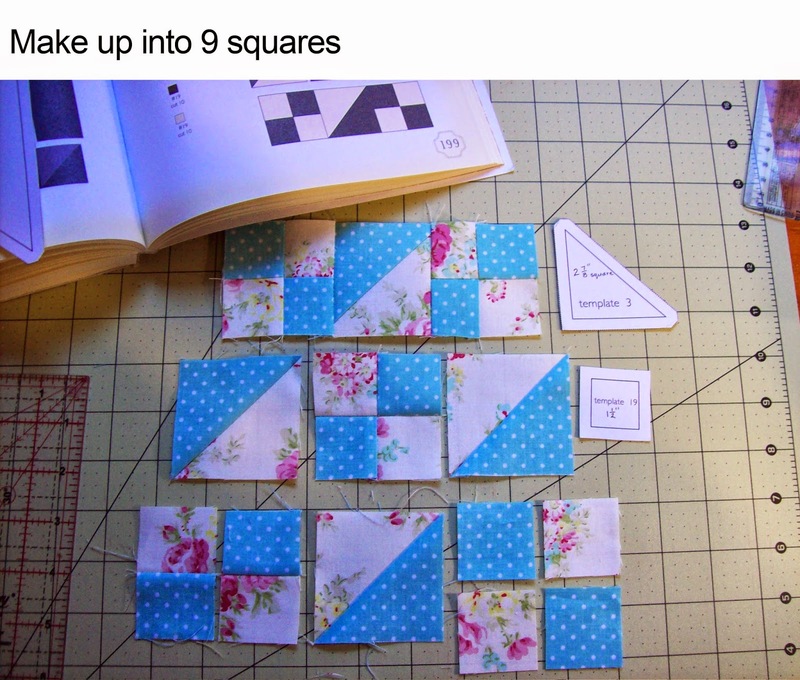 Using the 10 small squares make these up onto ½ square triangles. 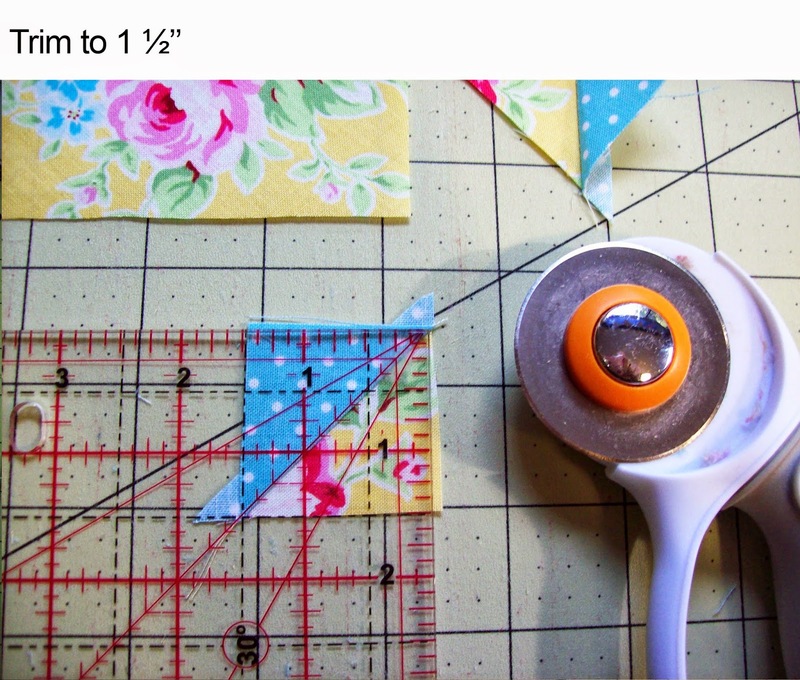 Press the seams towards the aqua and trim to 1 ½’’ keeping the diagonal line exactly from corner to corner, for 18 # 13. Arrange and sew in place as per book. You will have one extra square. You could use this in the postage stamp block if you wish. Postage Stamp use template 19. 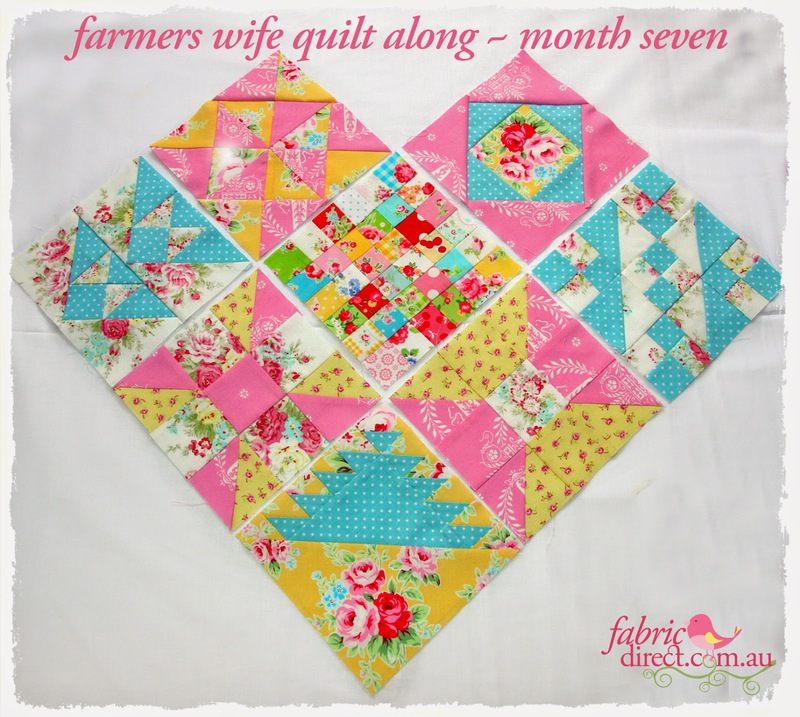 Hopefully you have been cutting 1 ½’’ squares from all your fabrics as we have gone along but if not cut 36 x 1 ½’’ squares from fabrics you have already used in your quilt. 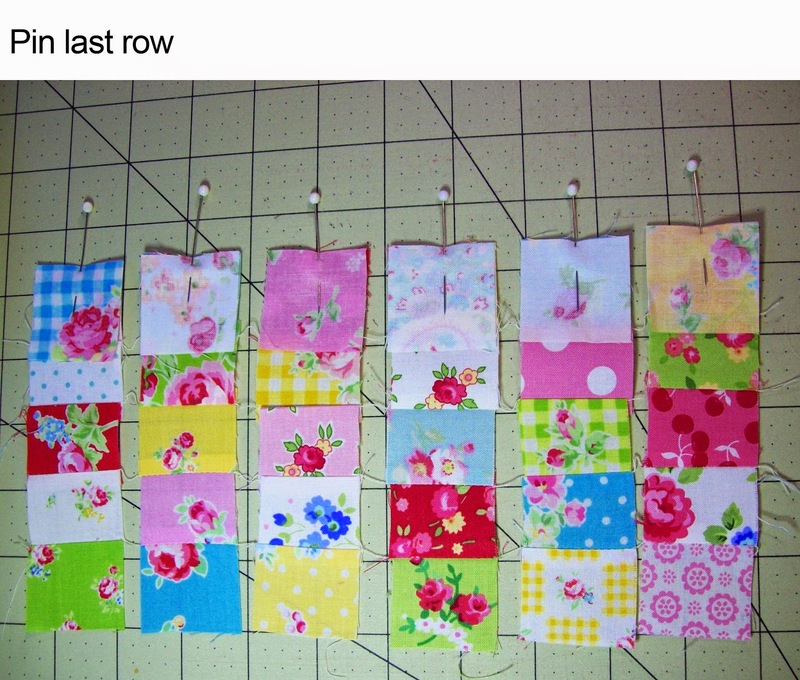 Lay out 36 fabric squares in 6 rows of 6. Move them around until you are happy with the placement. Try not to have the same colour next to each other but don’t worry if they meet on the diagonal. Place four different coloured squares in the corners. Don’t be too fussy, I did change two of mine as I sewed them together, not a good idea but I kept to the same colour and only changed the fabric. 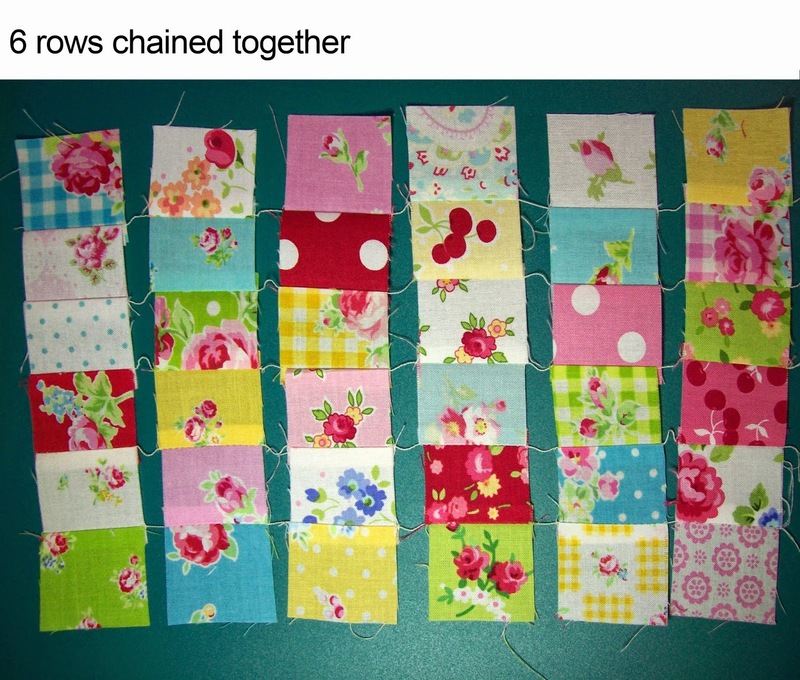 Use Chain Piecing to put this block together, follow the photos below. Take note of which colour the top left hand square is and make sure it is always put back in the right place. Count your rows from the top down, starting on the left corner. Working down the second row turn each square over to the left and place it, right sides together, on top of its neighbour in the first row. 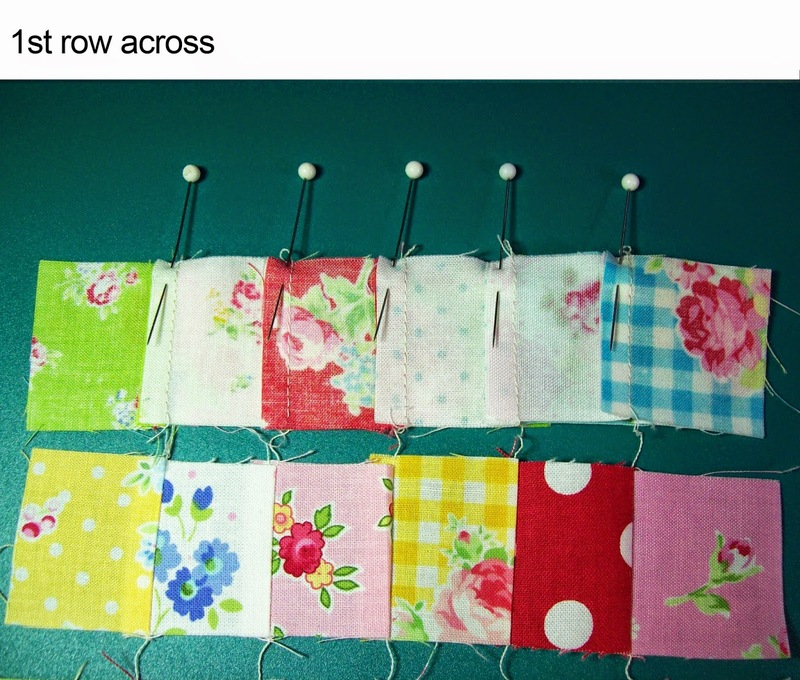 Stitch down the right side of each square in turn but don’t cut the thread between each square. Press the seam in each row facing the opposite direction to the one next to it. Place these two rows back in place, noting the top left square is the right colour. Now turn the third row, to the left, over the second row and sew down the row as before. Press the seams in the same direction as their neighbour in the previous row and put back in place. 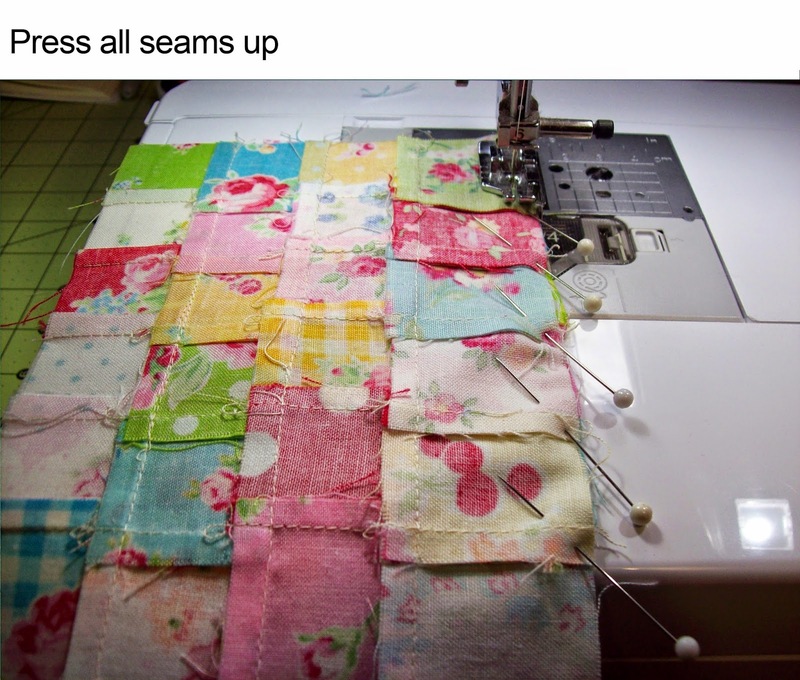 Continue in this way until all of the blocks are joined in horizontal rows and are held in place with joining threads. This is why it’s called chain piecing. Count your rows across from left to right now. Fold the top row down to cover the second row and pin each seam join to match across the row and sew in place. The seams should ‘nest’ together because they have been pressed in alternating directions. Press these seams all facing the same direction. 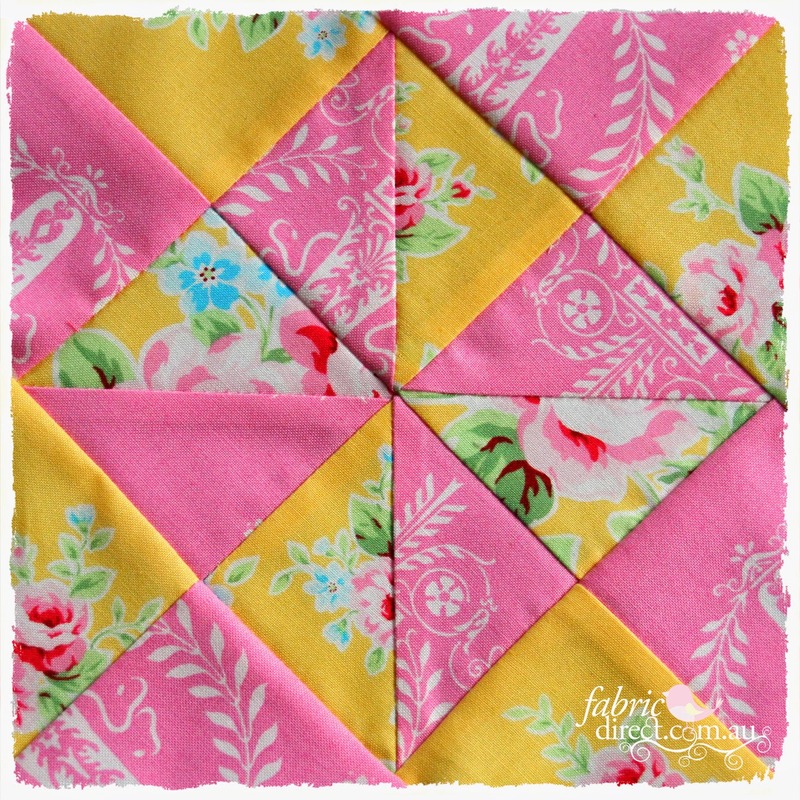 Continue to fold, pin and sew each row until your block is complete. I loved making this block. I think I’ll make another!